This is for those who get overwhelmed by light and genuinely have no clue where to start or how etc. We are writing this for those of you who are, in the nicest way possible, clueless when it comes to lighting! 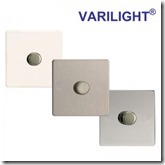 Light is essential to any house and the importance of lighting cannot be stressed enough! The way to make the most of your lighting is to have either various fixtures or dimmable lights so that the light can be changed depending on the atmosphere and mood you want to create. You would also need to take into consideration what natural light the room gets, you can calculate this by working out which way the room faces. We love dimmable lighting! Everyone loves dimmable lighting! It is ideal for any room and can help with any lighting issues you might have due to the fact that the strength of light can be changed. The light can be made brighter or dimmer depending on the atmosphere or ambiance you wanted to create. Most lighting fixtures can be made dimmable, and then you would need to use dimmable specific lighting but it isn’t a hard or complicated job to do! A flush mount is ideal for low ceilings; it sits really close to the ceiling and gives out large beams of light because of its height. There aren’t many variations or designs for this fixture. Unlike Semi-Flush mount where it is still quite close to the ceiling – only approximately a 1 foot drop – but more attractive designs are available in this option because you can potentially have pendants available in this mount. Both of these different types would be perfect for bathrooms or kitchens because they give off such great light and aren’t “fussy”; in both of these two rooms the main focus of lighting fixtures is to give off light, and not add to a room. Pendant lighting is the most popular and widest variety of lighting; this is because pendant lighting by definition is anything that is suspended by chain or cord. There is so much that can be said about pendant light, but fundamentally it is also the most decorative of lights. Chandeliers come under this category and when you think about all t he different variations and designs available, you will get a better idea of the depth of pendant lighting. It is essential that you make sure you buy the right size pendant for your room, if you click here, it will take you to an article which will teach you how to go about finding your perfect chandelier for the size of your room. 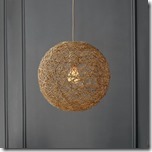 Pendant’s in kitchen’s are becoming increasingly popular as we see these fixtures above dining tables or islands. 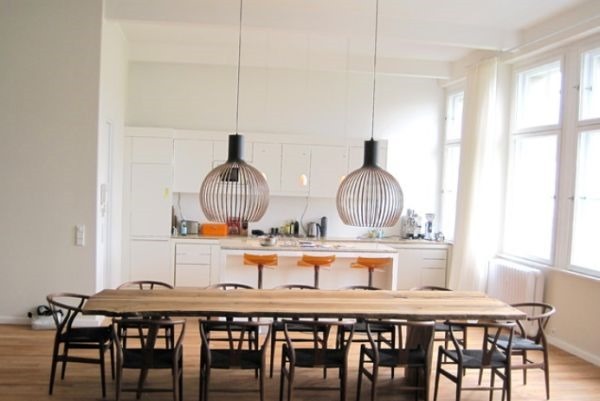 The height of the pendants in this room is the most important thing to remember; you don’t want taller people to have to duck under it to prevent them from hitting their heads and you don’t want to not be able to see across the table because the light is obstructing your view. It is important to make sure the light, when hung, clears the head of the tallest of anyone that might come and visit. If you are thinking about having more than 1 fixture across a space, it is important to make sure that they are evenly spaced, both for aesthetic reasons but also to give even light distribution. Lights above dining tables again, are becoming more and more popular. With this though, it also means the height and size of the light needs to be taken into consideration. You don’t want for the light to swallow up the table because it is too big. The way it can be calculated is if you buy a fixture that is between ½ and 3/4’s of the size of your table. The height can also be changed to give the room a different ambiance; lower for intimate settings or higher for more casual situations. The optimum and average height bracket to take into consideration is between 36-48 inches above the table. 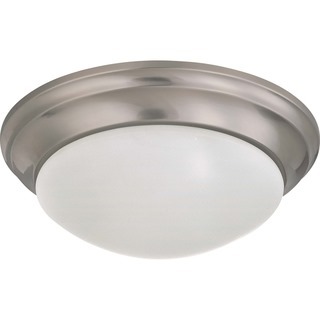 Recessed lighting or Track Lights are arguably the least used lights; it is in bathrooms or kitchens these are frequently seen in or for use for specific purposes. Recessed lights are embedded in the ceiling which helps with rooms that might have lower ceilings; there is also the option of being able to make them tilt in a specific position to highlight something or light up an area of the room that is in need of light. Track lights are similar in the way that they can be positioned in any way on the track you might want – they can be slid for but also tilted. Also good for low ceilings, but make sure the finish of these matches the rest of your interior otherwise it would unfortunately backfire. 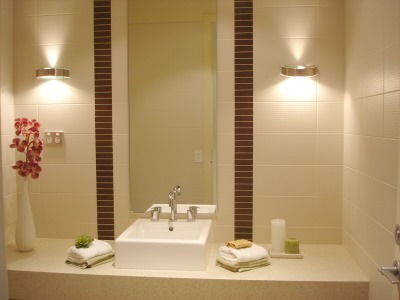 Bedside and Bathroom Lights are small lights for specific purposes; in the bathroom to light up a mirror, in bedside to light up the small area of the room you are occupying. 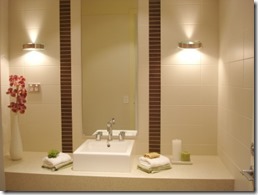 In the bathroom, mount a light either side of the mirror approximately 36-40 inches apart to get evenly spaced light. It is also recommended that you have a total of 60-80w in order to light up your face and the area in front of the mirror. This would be a total between both light fixtures should you have one on each side of the mirror. For bedside lighting, your sight is what needs the light; so we recommend that the bottom of the shade is a littl e below your eye line. This would mean that the fixture should stand between 26-28 inches tall. Too high and you won’t be able to see very well, too bright and you may as well have the ceiling light on, so we believe 40-60w is the best wattage bulb for the bedside. We hope this helps you! We are always available for any additional help or questions you might have so please contact 01420 520521. We look forward to hearing from you.